–Levon Aronian dominated in 2017 to claim the overall tournament title. –The tournament runs August 10 through 16 in Saint Louis, Missouri. We plan and execute the best chess events in the world. From superior organization and amenities to a full-blown spectator experience, we show professional chess as it’s meant to be enjoyed. Watch your favorites battle it out over the coming months. Paris, Leuven, Saint Louis and London… Chess has arrived. The Grand Chess Tour brings 23 of the world’s strongest chess professionals together through a cycle of five international tournaments, each representing the new gold standard for professional chess. Every pivotal move will be broadcast live alongside world-class grandmaster commentary, watching the world’s best players compete for lucrative tournament prize funds and race for the additional Tour prize. Last year, the Saint Louis Rapid & Blitz event came immediately after the Sinquefield Cup, a $300,000 event featuring ten of the best chess players on the planet. 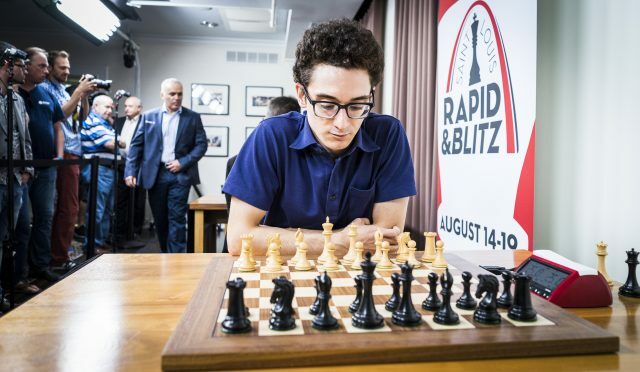 This year, the schedule has been reversed with the $150,000 Rapid & Blitz event being held first followed by the Sinquefield Cup which runs at the Saint Louis Chess Club August 17-28. Most competitive chess tournaments are contested under ‘standard’ rules contested under ‘classical’ time controls. This tournament will feature ‘rapid’ and ‘blitz’ rules. The difference is the amount of time allotted for the players to study the board and make their moves. For major international tournaments FIDE regulations stipulate “90 minutes for the first 40 moves followed by 30 minutes for the rest of the game with an addition of 30 seconds per move starting from move one.” Last year’s World Chess Championship had the following time control: “100 minutes for the first 40 moves, 50 minutes for the next 20 moves and then 15 minutes for the rest of the game plus an additional 30 seconds per move starting from move 1.” In other words, players have two hours or more to contemplate and execute their strategy. Making things more interesting–while a good chess player can be effective at any variation at the highest level there is some differentiation in the standard, rapid and blitz rankings. You’ll see reigning World Champion Magnus Carlsen at the top of all three variations but the rest of the standings show a significant degree of difference. Player with the highest combined score after 18 Blitz games and 9 Rapid games will be graded the winner of this event. Information from the Grand Chess Tour official website will be used for grading. Player with the highest score after 9 Rapid games will be graded the winner of this event. Information from the Grand Chess Tour official website will be used for grading. Player with the highest score after 18 Blitz games will be graded the winner of this event. Information from the Grand Chess Tour official website will be used for grading. Players with the two highest combined scores after 18 Blitz games and 9 Rapid games will be graded the winners of this event. Information from the Grand Chess Tour official website will be used for grading. Players with the two highest scores after 9 Rapid games will be graded the winners of this event. Information from the Grand Chess Tour official website will be used for grading. Player with the two highest scores after 18 Blitz games will be graded the winners of this event. Information from the Grand Chess Tour official website will be used for grading.